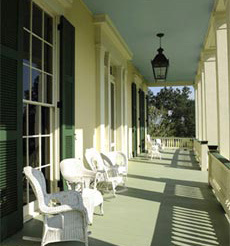 Dr. Marion Rundell, owner of Bocage Plantation, has been collecting antique furnishings and accessories for over 20 years. He has searched the best antique shops in the United States, and has been an avid antique auction bidder. Today he has a 21,000 square foot of air-conditioned warehouse where he keeps his treasurers. For his collection at Bocage he has selected some of his favorites. Below is a list of most of the major furnishings, keeping in mind that Bocage will always be a work in progress as Dr. Rundell acquires new fine antiques and accessories, or just rotates things around for the joy of displaying them in an historic plantation. noted New York City furniture makers, circa 1855. The set is named Stanton Hall after Stanton Hall in Natchez. Turtle top center table, circa 1855. Tiffany mantel clock (in front parlor), 19th century. Old Paris porcelain vases, circa 1850, on either side of clock. French oak bookcase, circa 1895. York furniture maker John Henry Belter, circa 1850. Three-quarter tester bed by Mallard. American Empire mahogany armoire, circa 1840. Marble-topped dresser by Alexandre Roux (pronounced “Roo),” circa 1850. 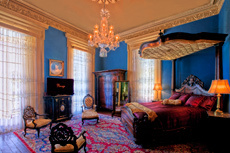 A native of France, Roux was one of the leading furniture makers of the Victorian era in America. Three-quarter tester bed signed by Charles Lee. Ladies rosewood writing desk attributed to Roux, circa 1855. Night table by Roux, circa 1855. Pair of antique Italian chairs, circa 1870. Thomas Sully portrait over desk, circa 1840. Sully was one of the most famous portrait painters of the 19th century. American Empire four-poster mahogany bed, circa 1835. American Empire mahogany armoire, circa 1830. American Empire mahogany chest, circa 1830. Bed by Roux, circa 1850. Single door armoire, circa 1855. Nine-piece heavy carved Italianate Revival parlor set, circa 1880. French round claw-foot center table, circa 1850. Bronze dore chandelier with alabaster shades. circa 1812 (Son of famous artist Charles Willson Peale). English walnut dining table, circa 1840. Austrian mirrored cabinet, circa 1850. Etagère by J and J Meeks, circa 1850. French chandelier cut and frosted crystal shade, circa 1895. Large collection of American Brilliant cut glass. rosewood and ivory, circa 1880. Walnut and bone game table, circa 1890. Painting by Pal Fried, well-known Hungarian artist.